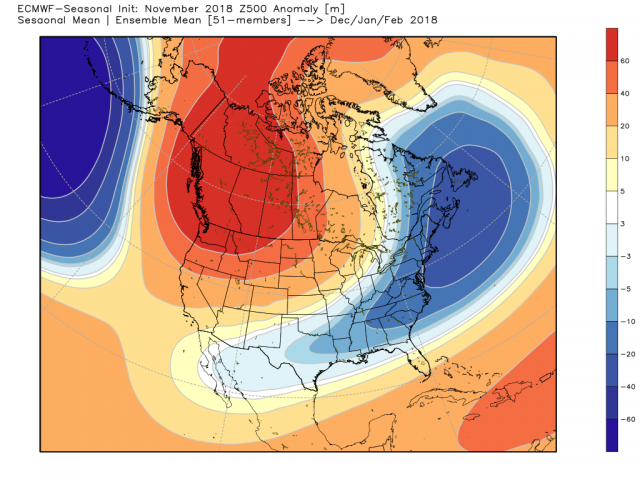 This next cold shot though it won't last forever about (10 day) if any indication of what winter cold will be like holy mommaluke we are going to have bout with very cold air. 2018 total: 183 days (60%) = seismic activity and down the road weather affects - HL blocking, more cloudy days etc. 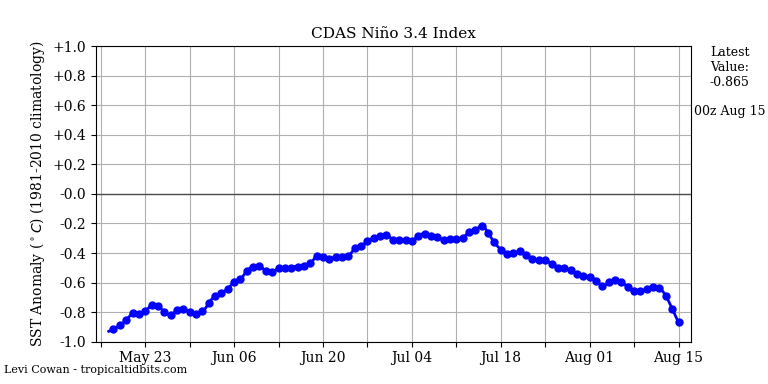 Me, I am just counting on shorter days, and a -AO to bring lower air pressure because that greenlights stronger cold air getting here and snow. 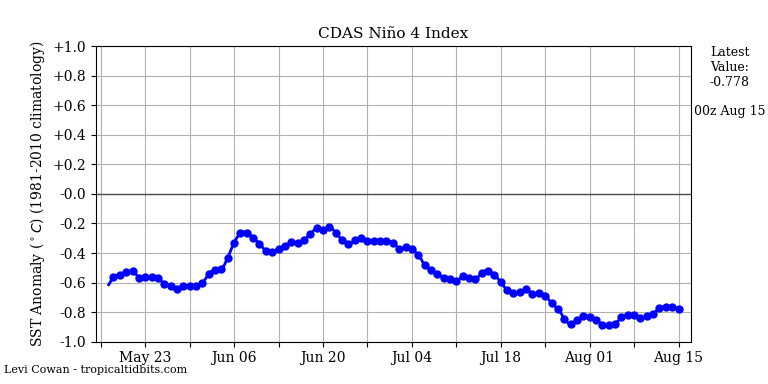 I am nobody's forecaster but a -AO makes my socks pull up. two legit storm threats and I mean snow threats one around the ninth which favors inland areas the other between the 12th and 15th. 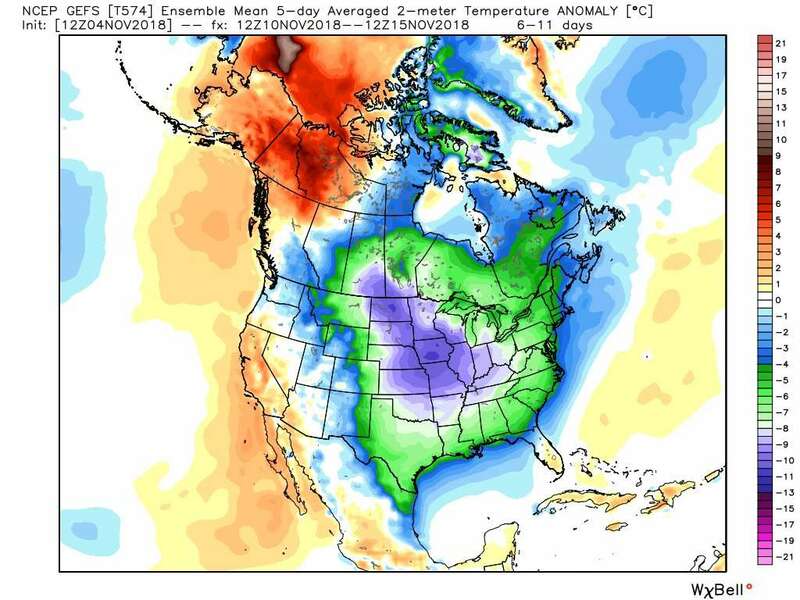 an anomalously cold airmass will be entering the eastern U.S. this weekend some 10-15* below normal temps. active southern branch interacting with this cold snap and bingo we snow in November. we shall see. 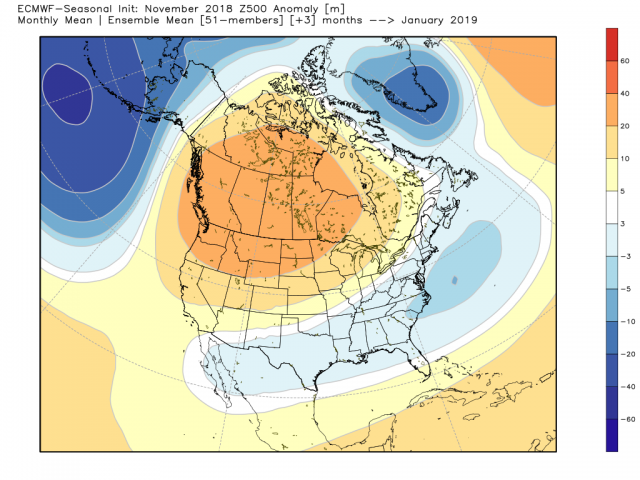 HOT OFF THE PRESSES PEEPS = EURO SEASONAL SHOWING A BANG BANG WINTER FOR US INCOMING!! 1963 DECEMBER INCOMING? THIS WOULD BE TREMENDOUS!!! Mugsy, love that Dec 1963 map.We had 8 or 9 inches of snow in Fort Lee the day before Christmas Eve and the big snowstorm in February 1964.Hope this analog proves out for this season.I remember that as a cold winter. docstox12 wrote: Mugsy, love that Dec 1963 map.We had 8 or 9 inches of snow in Fort Lee the day before Christmas Eve and the big snowstorm in February 1964.Hope this analog proves out for this season.I remember that as a cold winter. Me too - lots of good signs so far. Mugsy...Godzilla taking a leak! HILARIOUS! @ Doc - best analogy I could come up with - Franks Godzilla !! This from a pro met Webberweather - GREAT SIGN!! After this cold outbreak that will make people shiver in their shoes for this time of year we look to moderate for about a 10 day period after the 20th - there is an impressive MJO wave in the Indian Ocean that as it moves east will propagate the MJO seemingly into warmer phases as Ventrice pointed to. 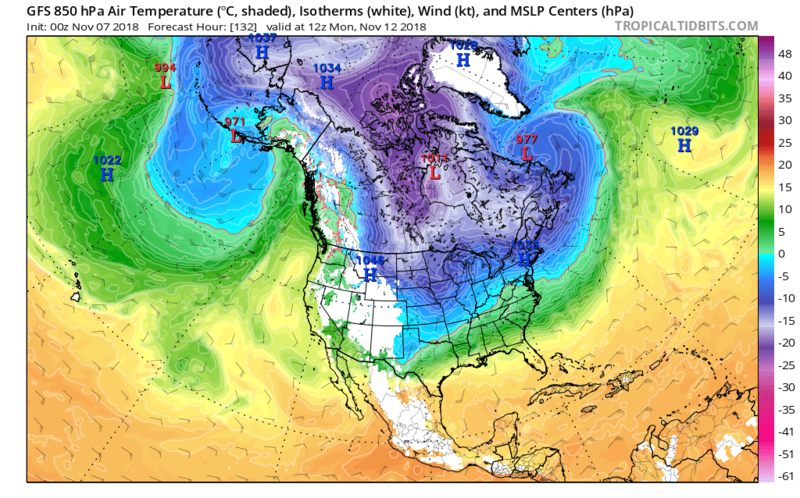 BUT have no fear Old Man winter will be back and with a vengence - you are bottling up the beast in the HIgh Arctic and once that ALeutian Trough kicks in and it spikes a ridge in the West Coast all hands on deck for we begin to rock and roll. Could be a December to remember peeps. 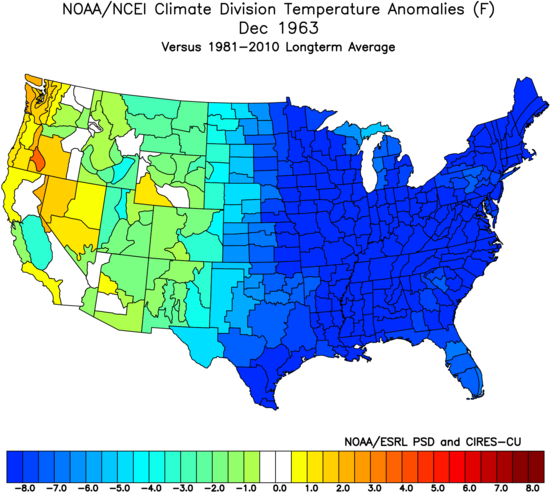 It may not start out that way but by the early teens we should see that evolving back to a gripping winter pattern. Heck it could change earlier but not much later from all indicies I am seeing. Now this will be good as it will enhance the ability for a SSW event as being forecasted for a disruption in Mid Dec of the Polar Vortex. The EAMT and Pac Jet Extension will aid in this as well so we'll take a 10 -12 day moderation and then allow this heat to jet set poleward and allow the aiding of a SSW as I see it. Okay so it will get cold this weekend and then the bottom falls out next week. 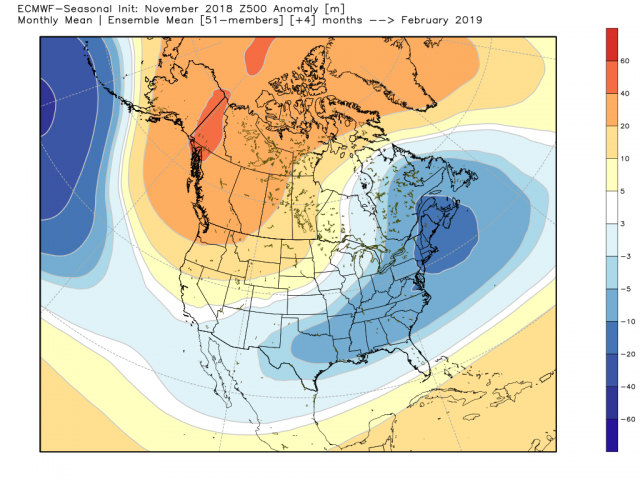 ….It looks like we are back into a new wave propagation with a similar pattern; which given the SSTA configuration should cont well into the winter. 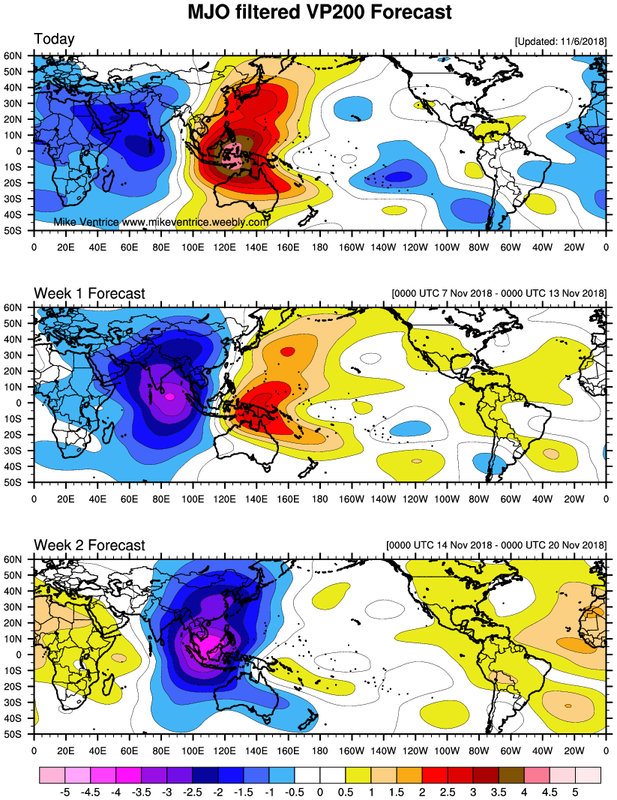 Below are the current MJO forecasts for the next two weeks. 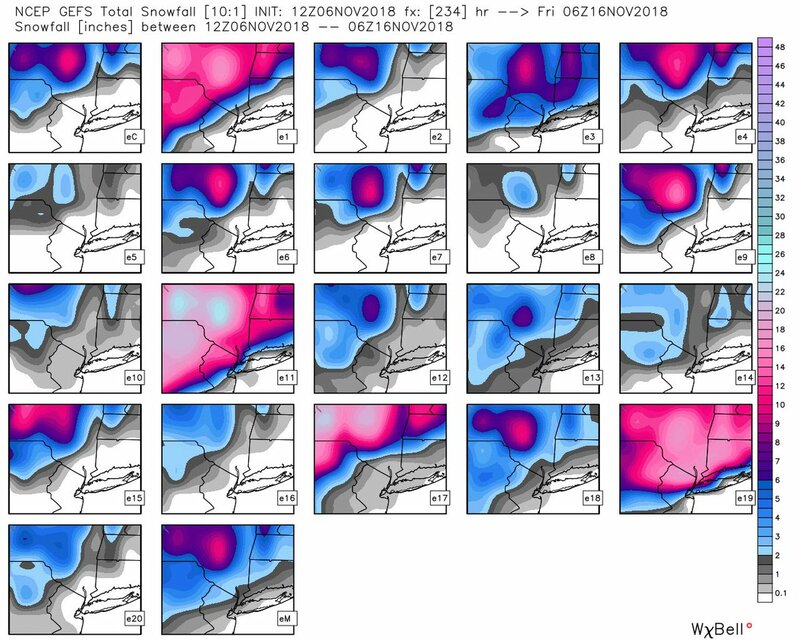 Both the Eruo and GEFS have a forecast and a "corrected" forecast. I will post the "corrected" forecast as the second image. Notice the GEFS forecast takes the MJO well into phases 3-4 towards 5 whereas the corrected forecast does not. I fully expect the SSTA configuration to prevent this wave from entering phases 3-5 with any amplitude. 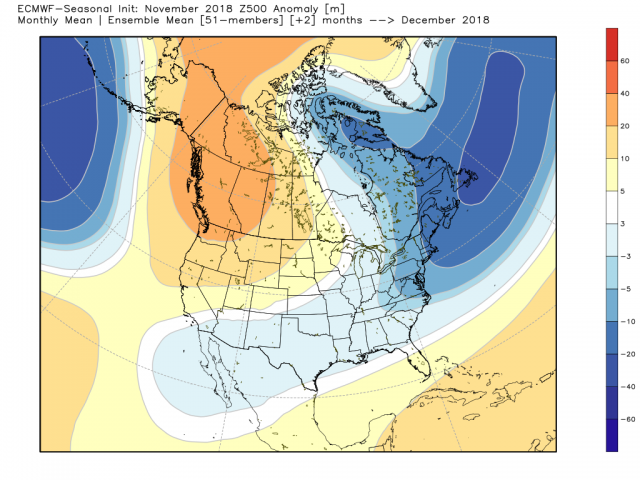 …...As Mugsy posted above I expect modeling to go towards a cooler soln overall as we head into the second week of Nov with some warmth, relative to avgs, ahead of phase 2. BUT I don't think we torch by any stretch of the imagination. Lets revisit this convo. Here are just the corrected MJO forecasts from prev vs today. As you can see we are correcting with less amplitude into the Phases 3-5 as expected. And if you look at the direction the end of the forecast is headed you'll notice back towards 8. 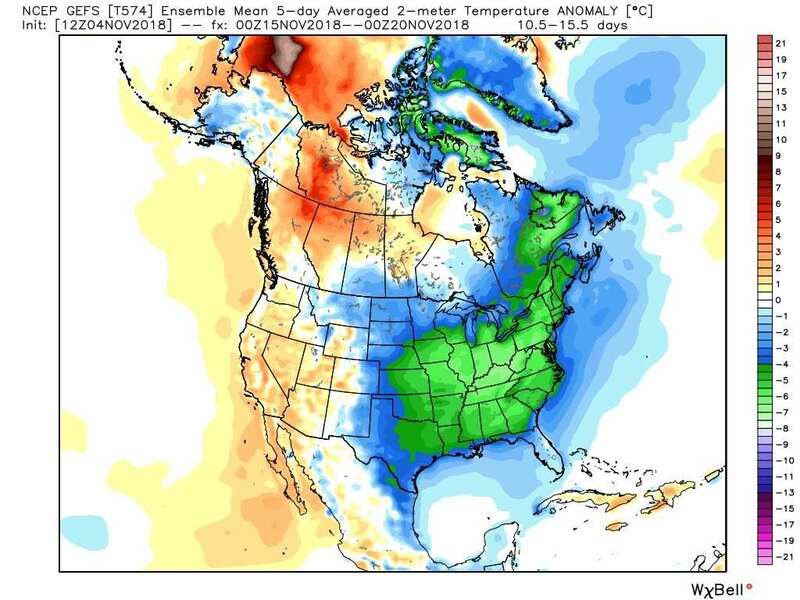 Just like in prev years when weve seen a cold spell show up in the LR only to see it evolve into not nearly as cold as it looked I can see how this "warm spell" or period of moderation everyone is talking about after the cold shot next weekend into next week will end up not nearly as warm if not cool when we get closer. Well see. 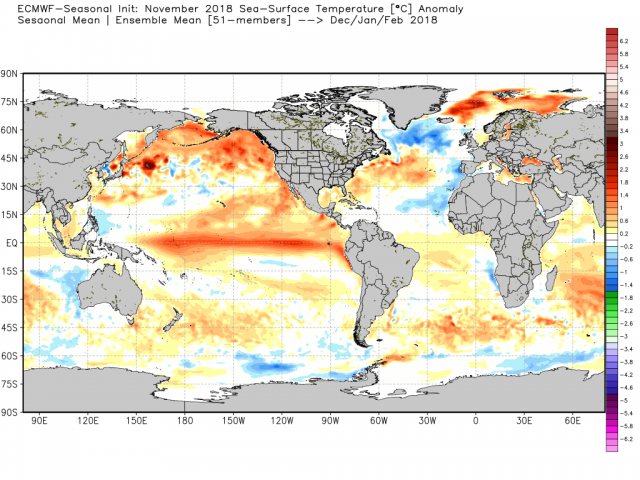 I concur on the moderation period and the next few days of these charts will help tell, one thing is for sure the cold waves incoming are going to be very cold for this time of year. I hope the Euro MJO forecast comes to fruition as it kills the wave in the COD and then remedies it in phase 8. 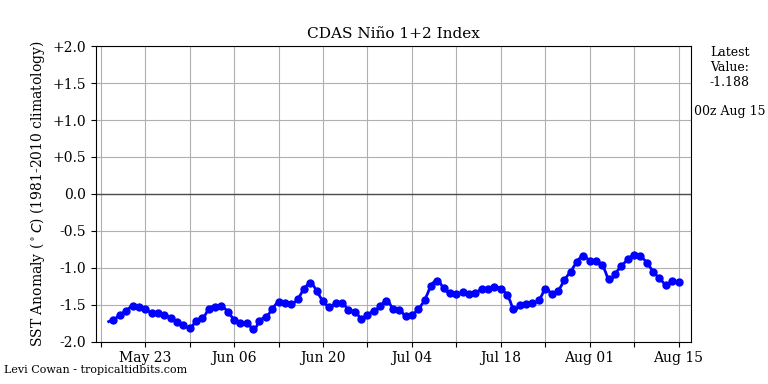 That seems to be the "pattern" as we move forward. I have read the EAMT is going to pump the PAC JET extension and bring a flat zonal flow. This doesn't scream torch but more normalish air and hopefully the WAR doesnt flex it's nuscle. 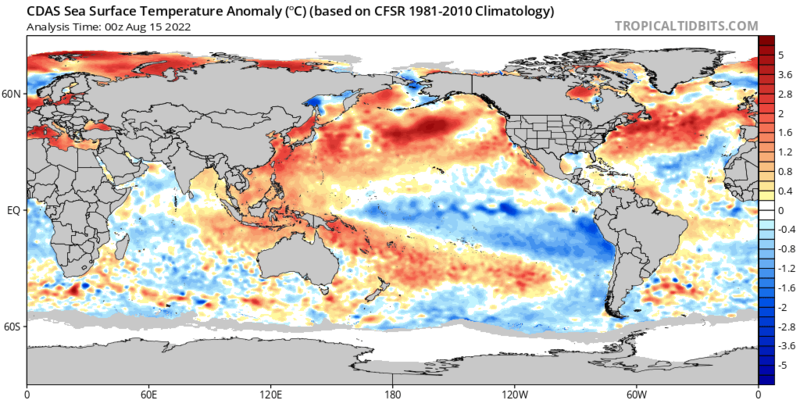 Temp in the NA region and off the coast have cooled considerably so we shall see. Great discussion and maps here peeps. Tell Lee Goldberg whom I like that we were in this a few days ago chappy, LOL!! 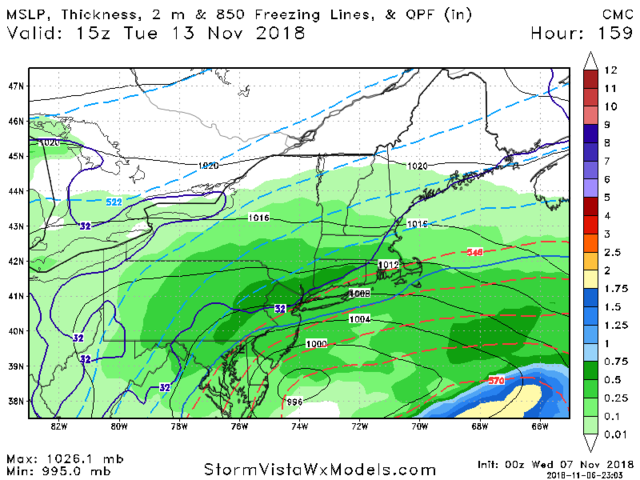 The GFS is a rain to back end scenery for the burbs and maybe wet flakes for the coast. Interior snowstorm yes. On my phone so when I get to my computer I'll upload maps. Sloop at that cold air building up North WAITING to unleash it fury on us.